After 367 strikeouts, 417.1 innings pitched, and 60 games started, fourth-year Kim Cygan is graduating, leaving behind a lasting impression on her team. The pitcher completed her final season this year, and her leadership will be sorely missed. From her first season on the team, Cygan made her mark. She pitched 18 games, starting 10 of them, and struck out 75 batters as a first-year. 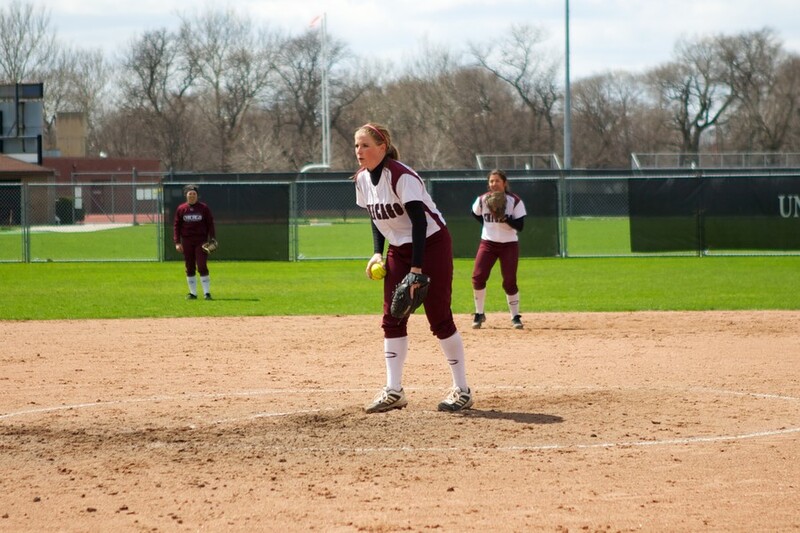 In her second year, she was promoted to starting pitcher and captain, positions she would keep for the rest of her Maroon career. Cygan is a natural leader, and her teammates are full of respect for her commitment to the team and the sport. Although Cygan was a strong performer in all four of the seasons in which she played, her third year stands out. She started 20 games and finished the season with a 0.99 ERA, a personal best and the sixth-lowest ERA in all of DIII. The team finished the year with a 26–11 record, and Cygan was a big part of the team’s success—she held her opponents to a .177 batting average, and was named to the all-region and all-conference teams. “Junior year was definitely my best year as a pitcher,” Cygan said. While the 2013 season didn’t quite measure up to last spring, Cygan remained a force to be reckoned with. In one of her final games, she pitched a no-hitter, the first of her career, against Beloit, pitching five innings and striking out 11 batters. Cygan’s athletic career may be over now, but she won’t be forgotten any time soon. Not only has she had a big influence on her team, she has made considerable changes to the record books, breaking 12 records in her four years. “I will probably miss most the competition and playing on and for a team,” Cygan said. While Cygan’s ability as a pitcher has certainly had a positive effect on the team, her leadership was just as valuable. A captain for three years, she truly enjoyed supporting her teammates and the role she played in shaping the team. Besides being a leader on the field, Cygan was also president of the Women’s Athletic Association (WAA). The WAA represents the University’s female athletes and organizes various events around campus, including the annual Hoops for Hyde Park Schools fundraising raffle, which raises money for the physical education departments of local schools. Cygan has helped organize the event for the last two years. Through her leadership and skill in softball, Cygan has accomplished a great deal over four years. It will be a big task to replace her presence in the team. “It’s hard to imagine her not being a member of this team, and her enthusiasm and passion for the game will be missed,” McManus said. Though Cygan will be sad to leave her team behind, she is ready to start her job and new life downtown once she graduates.